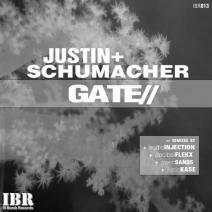 IBR label owner Justin Kase provides a masterpiece into the unforgettable “Gate” EP with his remix. The continued efforts and evolution of his style are showcased as the label head keeps proving he has the ability to set the four bar beat very high. The approach is on the grooving side of the scale and without a doubt my personal favorite on the EP. Mega filthy tech with a whopping bass kit, scattered highs and a retro synth all enable the listener to move. A great late night early morning track which is infectious should play to peoples vibrations. Within each drop Justin keeps adding that subtle note or chord which allows electronic djs and fans to stay focused on the overall message. The Ill Bomb crew combined a group of musicians that truly understand every aspect of production while maintaining a higher value of sound. We can only look forward to more from this emerging label. Decibel Flekx’s remix of Justin Schumacher’s “Gate” brings in a hallucinatory feel. Mixed bag of arrangement that isn’t quite as appealing to your standard audience although I could see dj’s such as James Holden or Nathan Fake potentially supporting it. A grinding gears with only fear in mind crunch through this gritty feel. If I was grading parmesan cheese made out of granite, then shooting those fragments into space this is what it might sound like. To each their own as Decibel clearly brings his own style to the table, just not sure if I would invite this remix over for dinner. Audio Injection’s interpretation of “Gate” takes his signature style, hard, rocking, modern techno, and crushes floors. A bass package with no oxygen in sight, this track combines the hard hitting bounce that reverberates through slices of metallic chimes as well as an effortlessly timed chord which completes the relentless low end sub. Gaining notoriety since its release and receiving massive support from Chris Liebing at Timewarp in Germany and Movement in Detroit this year, the Audio Injection remix of “Gate” doesn’t look like it’s going anywhere but upwards as it hits the Beatport top 100 for the 4th week in a row. The Owen Sand’s remix of “Gate” chunks it up with his percussion additives that give a different perspective into the sound. Supplemental vocal additions are a warm welcome in this version of “Gate”. The coasting tech approach that sends synth builds through the track are accurate as the drop compliments the overall feel. A steady bassline rolls along while the one two snap snares meld the track together with a bubbling techno brew. Professional grade composition, uniquely crafted elements, and a persuasive chugging ambience prepare you to move into the night with another top notch remix. Justin Schumacher’s original off the highly anticipated release from the IBR camp lays down a rich structured bass thump to open the track up. Justin’s seasoned veteran abilities are showcased as the level of production speaks for itself. Gate is a voyage through massive soundscapes that chug along like an asteroid looking for a planet to smash into. The atmospheric qualities are prevalent throughout as this melodic techno blade runner peeks into the future while not forgetting the past. Precise high’s, simplistic quirks, shakers, and snares all play a part in the original. The arrangement and all its fluidity grab the techno state of mind and run off into another dimension. Peak hour blitz to get a hard charge from a crowd can be set by utilizing “Gate” and its value for audio motion. In this day and age there is an abundance of fresh beats but not all releases stand out as much as Ill Bomb Record’s “Gate”. Tremendous replay value and if you like pounding grooves you will not be disappointed. Chris Liebing drops GATE - Audio Injection remix in Detroit mainstage!